Rober Koch was a physician and microbiologist from german. Robert Heinrich Hermann Koch was born on 11 December 1843. He also known as father of bacteriology and founder of modern bacteriology. Robert Koch identified the specific causative agents of tuberculosis, cholera, and anthrax. 1. Perfected bacteriological techniques and introduced methods for isoloation of pure strains of bacterio. 2. Introduced methods of obtaining bacteria in pure cultures using solid media. 4. Discovered the anthrax bacillus 1876, Tubercle bacillus 1882, and the cholera vibrios 1883. According to koch's postulates. a microorganism can be accepted as the causative agent of an infectious disease only if the following conditions are fulfilled. 1. The organism should be constantly associated with the lesions of the disease. 2. It should be possible to isolate the organism in pure culture from the lesions of the disease . 3. The isolated organism (in pure culture) when inocualated in suitable laboratory animals should produced a similar disease. 4. It should be possible to re-isolate the organism in pure culture from the lesions produced in the experimental animals. 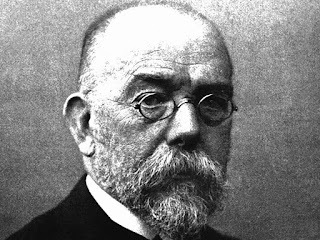 Robert Koch observed that guineapigs already infected with tubercle bacillus responded with an exaggerated inflammatory response when injected with the tubercle bacillus or its protien. This hypersensitivity reaction is called koch's phenomenon.